The moment crypto-enthusiasts, traders and investors have been waiting for is here. Bitcoin burst through the resistance on Tuesday, Apr. 2, to reach a value of $5,000, the highest since November 2018. Within an hour, BTC broke out of the $4,200 resistance area, surging as high as 20% before a pullback brought it level around the $4,700 mark, before pumping forward again to just below $4,800, or a 16% increase at the time of publishing. 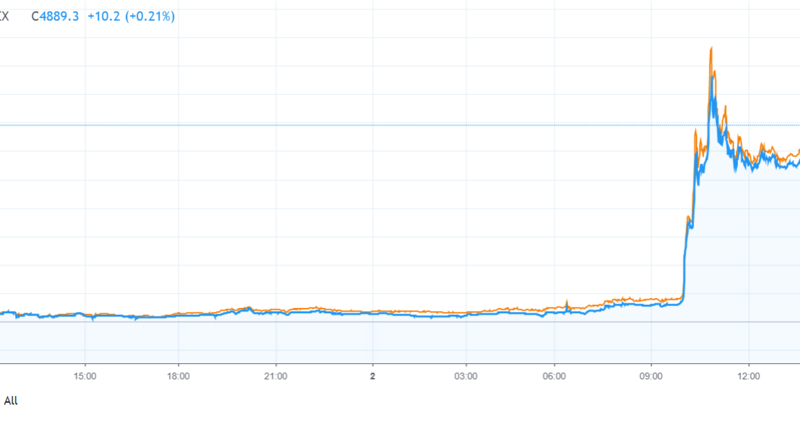 The price surge saw bitcoin’s market capitalization jump by $5 billion to $78.8 billion, highest since Nov. 22, 2018. The currency didn’t just break through one barrier; it surpassed 3 key resistance levels at $4,200, $4,420, and $4,567 to excite enthusiasts. Well, on Monday, a technical analyst had talked about the existence of a $80 million sell wall in the market which needed to be absorbed in order to break through the much-anticipated $4,200 resistance. Once the barrier was breached, experts described the region above $4,200 as ‘hot air,’ with relatively low volume beyond that point triggering a short squeeze on trading platforms, boosting the price beyond $5,000. Is Bitcoin’s Bearish Trend Over? Many experts believe that bitcoin might retrace back to $4,200 or so, but a rise to $5,500 seems reasonable and likely in the near future, as long as the currency stays above the $4,000 mark. A number of popular altcoins enjoyed their own personal surges, with ETH and XRP rising by up to 7%. Bitcoin took other top 20 coins along for the ride with Litecoin and EOS enjoying gains higher than 10%, Tron gaining 11%, and Monero and IOTA rallying up to more than 9%. The crypto market reached a market capitalization of $160 billion, its highest since the November 2018 dump because of Bitcoin amazing price boost. Things look peachy in the crypto-world.